Q. What resources does the library have for business career research? I need help doing research on business careers, resume and cover letter preparation, interviewing techniques, business etiquette, business directories, or internships. The library has many fantastic resources to assist you in all aspects of career research. Many are available online and can be accessed by anyone with a NetID and password. The Business Career Reseach Guide was developed to help students and faculty navigate the variety of databases, e-books, and links the HBLL offers. 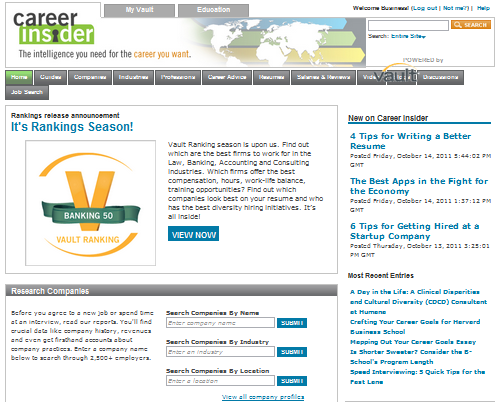 One of the most useful databases for career research is the Vault Online Career Library (see screenshot below.) With 77 comprehensive guidebooks available on a wide range of careers and over 3,000 company profiles, Vault is a valuable resource for career research. You can find a short Vault video tutorial here. If you need any additional help researching business careers, stop by HBLL 1210 to speak with a business reference librarian.